The familiar red Waterway Recovery Group Ford Transits containing twenty one members of the Newbury Working Party Group (NWPG) arrived at Brimscombe Port on Saturday 5th July for the first of a number of week-long Waterway Recovery Group Camps. The interesting thing about 'the wrgies' is the diverse range of day jobs and professional backgrounds they come from. The Griffin Mill project called for civil engineering knowledge and expertise ranging from manual labour and brick laying through to the operation of heavy earth moving plant. Bill Nicholson is a Town Planner by profession, and Graham Hawkes has a high responsibility day job in the Nuclear Industry. So planning and strategy is covered! Bill and Graham became involved with canal restoration on the Kennet & Avon Canal as students some 20 or 30 years ago. It has been said that history can repeat itself. On that basis the future of canal restoration would seem to be assured. Bill's team included four young people who will soon to be at various universities. All four were engaged upon the Duke of Edinburgh Award scheme. They each indicated that they enjoyed this non-academic activity and intended to maintain their involvement in canal restoration. The roll call of this tenacious team of modern day navvies also included a retired Royal Naval Commander, a legal executive and a professional plant operator on holiday. When asked why he was there he replied “Because I just like doing what I do, so why not?" Over the week 220 litres of diesel were used to move over 400 cubic metres of earth. 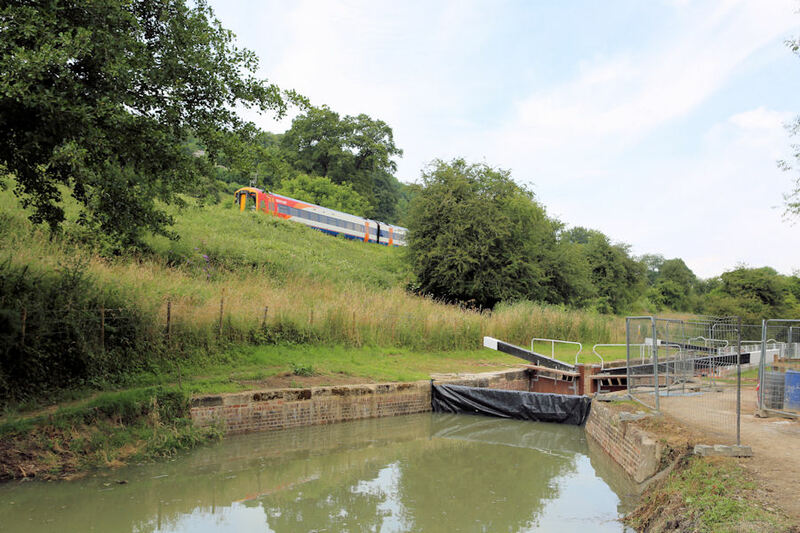 Weekend train travellers and towpath walkers can now be forgiven for thinking a boat might cruise through the peaceful waterside scene at Griffin Mill. However, it will be some while before that happens. This lock restoration is ‘stitch in time’ restoration. 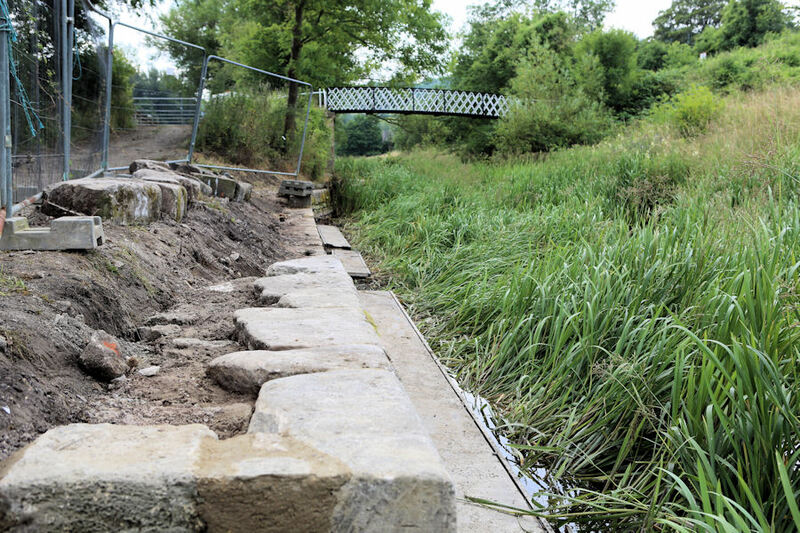 The land owner supports the restoration but is keen for the job to be completed in order that he might continue his agricultural interests without interruption. It is a fact that no successful enterprise can reach its goals without effective preparation and planning. This important role has been carried out to the highest level by Stroud District Council’s Jon Pontefract. Bill Nicholson praised the standard of preparation that had enabled his team to operate. Jon, in turn, handed out the plaudits to all the volunteers involved in the Griffin Mill job. He also commended the energy and expertise of the Cotswold Canals Trust volunteers who have been involved throughout the project. The CCT volunteers moved back on site on the Monday after the wrgies went home. With the ‘red shirts’ off about their other lives the ‘green shirt’ CCT team leader Les Morris and his crew will be installing the paddle gear. The paddle gear was designed by a Trust member and manufactured locally. The timber posts on which the paddle gear is mounted weigh around a 100 kilos each. The posts were designed and manufactured by CCT colleagues at the depot near Cirencester. Click here, or on the green icon below, to find out about becoming a Cotswold Canals Trust Volunteer. Click here, or on the red icon below, to find out about becoming a Waterway Recovery Group volunteer.